"Make me an instrument of your peace..." So begins one of the world's best known and well-loved prayers. 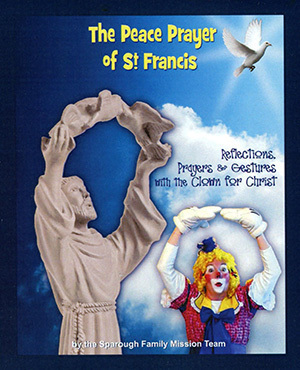 The Peace Prayer of St. Francis takes the Peace Prayer of St. Francis and breaks open the radical perspective of this beloved saint. In this 72-page mini book, the Sparough Family Mission Team explores 30 days of thought provoking prayers and inspiring mediations, punctuated with scripture verses and reflection questions. The entire text is illustrated with fun-loving gestures. In the eyes of the world, St. Francis was a fool who gave up everything to follow God. Spend 30 days with this Clown for Christ, and you will see the world differently.